* Allows you to create CD compatible WAV files so you can burn them on a CD. * Shell Integration: By simply right clicking a file, folder or a group of files, you can start the conversion process from Windows Explorer. * Support Drag and Drop: You can convert files or folders by dragging and dropping them onto the software's desktop icon or main window. 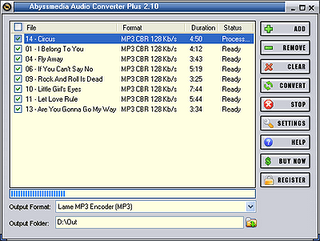 * Batch conversion: You can convert many files in one batch regardless of their source formats. * Ultimate Conversion Speed, optimized for newest Intel Pentium D and AMD Athlon 64 X2 CPUs.